Manufactured by the company that hold this product's design rights, you can be confident this item is tried & tested; otherwise, any return cost is on us. As the only US based retailer of this item, we have a chemist on staff to answer any technical questions. We also include a 20+ pgs eBook on Gas & Air Quality Hazards emailed at time of item delivery. Unlike cheaper models, FAN onboard allows REAL-TIME accurate monitoring of temperature (in C), humidity, formaldehyde (HCHO), total volatile organic compounds (TVOC), and micron-sized fine particulate dust (PM2.5/PM1.0/PM10). See when you need to change your home's air filter. Watch the levels of indoor total volatile organic compounds drop when the windows are opened. Learn where air quality is poorer and where your allergies can worsen. Allergies that are difficult to control with unexplained coughing, runny nose, and shortness of breath may be signs of sick building syndrome. -Calibrate if 0.000 indoor readings noted. Calibration (zeroing) done by pushing I/O button 2x quickly and only done when in fresh outdoor air. -Large variations / 9.999 TVOC readings do not indicate an error as this instrument is a sensitive electronic nose; environmental TVOCs vary much and high TVOCs often can result from interference from benign fragrances or odors. MULTIFUNCTIONAL & SCIENTIFIC - this next generation device accurately assesses temperature in Celsius, humidity level, and multiple measures of air quality including concentrations of formaldehyde, total natural & synthetic volatile organic compounds causing most odors (TVOC), and fine particulate dust matter (PM2.5/PM1.0/PM10) which travel deeply into the respiratory tract, reaching the lung alveoli. ADVANCED FAN & SENSORS - Unlike cheaper models, this device has a built-in fan to quickly draw in ambient air to allow REAL-TIME measurements. It incorporates a laser sensor to measure levels of dust particles and has a second electrochemical semiconductor sensor to measure formaldehyde and natural/synthetic organic compound levels. AFFORDABLE & PORTABLE - this easy to carry device can help monitor air quality at home, in the car, and in hotel rooms. The large 2000mAh battery provides portable power when DC 5V micro USB charging is not available. Information is displayed on a clear 2.8" 320 x 240 pixel color LCD display. ORIGINAL DESIGN & LIFETIME USA SUPPORT - We have worked with the supplier that holds this product's design rights so we are sure this item is tried and tested. We have Midwest-based chemist on staff to answer any questions you have. 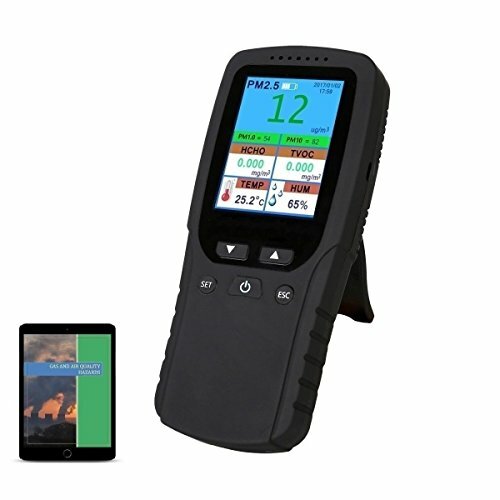 Also included will be a 20+ page eBook on Gas and Air Quality Hazards that is bundled with this detector. If you have any questions about this product by EG, contact us by completing and submitting the form below. If you are looking for a specif part number, please include it with your message.